When Does “No” Become “Never”? A good example is Mark 10:15. “Truly I tell you, anyone who will not receive the kingdom of God like a little child will never enter (οὐ μὴ εἰσέλθῃ) it” (NIV, also CSB, NET, NRSV, NLT). In general, the use of “never” is too strong a translation (over translating) since that is not what the emphatic negation is saying. Think of Jesus saying v 15, and either pounding a fist or stamping his foot or raising his voice. That’s οὐ μή plus aorist subjunctive. However, the reason “never” works in this verse is that as long as a person does not become like a child, he or she will absolutely not enter God’s kingdom (hear my fist pounding). The statement is always true and hence the use of “never” works. The ESV simply does not translate all the Greek: “shall not enter it” (also the KJV, “he shall not enter therein”). The NASB uses italics, but to my mind in an incorrect way. They write, “Truly I say to you, whoever does not receive the kingdom of God like a child will not enter it at all.” Why do they put “at all” in italics since it is their translation of οὐ μή plus aorist subjunctive? “At all” is an explicit translation of two Greek words; why give the impression that it isn’t? I keep coming back to a hobby horse (which is why it is a hobby horse) about the myth of “literal” translations reflecting the Greek. If you read the ESV, it simply omits some of the Greek. If you read the NASB, it implies that there is no Greek behind the “at all” even though there is. I was speaking to a couple Mormon missionaries the other day, asking them what they thought it meant to be a Christian. They answered that a Christian was someone who did what God expected them to do (i.e., works). I answered that I agreed that a Christian lives within the limits of a covenantal relationship, but how do you enter into the relationship in the first place? “You have to really want it,” they replied. I answered that this is why we would never agree. I (gently) said that their Christology was wrong, and that as long as they thought Jesus was a created being and the brother of Satan, they would never be able to call him “Lord.” And all the “wanting” to enter into a covenantal relationship would never be successful. They have to accept Jesus’ work on the cross with the faith of a child. They were very nice young men who offered to come back and weed our flower bed. But they will never enter God’s kingdom until they understand the nature of justification by a child’s faith. The NASB has, “They entered the synagogue of the Jews together” (also ESV; KJV has “both together”). BDAG B5bα gives “together” as a possible meaning, citing 1 Sam 121:11, so presumably they have some evidence of the meaning of the idiom. To me this sounds redundant and therefore less likely. Of course they went in together; Luke just said that a few words earlier. 21:5. Jesus calls out to them, παιδία, a word describing “a child, normally below the age of puberty.” It can also be used to describe someone “who is treasured in the way a parent treasures a child” (BDAG). Translations try words like “friends,” “children,” and “fellows,” none of which work in this historical situation. I wonder how a bunch of grown fishermen first responded when a stranger yelled out over the water, “Hey you prepubescent kids.” Sounds almost like The Goonies. Being literal does not make a translation good. I am only somewhat amused at the marketing of the Bible that champions what they call “optimal equivalence,” and surprise, surprise, they are the most optimally equivalent translation. The problem with their marketing is that I know the programmer who did the math, and his work is based on a reverse interlinear approach that sees the purpose of translation to be the replication of the words. You measure what you value. But two things happened to me the last couple days that illustrate the real issue. 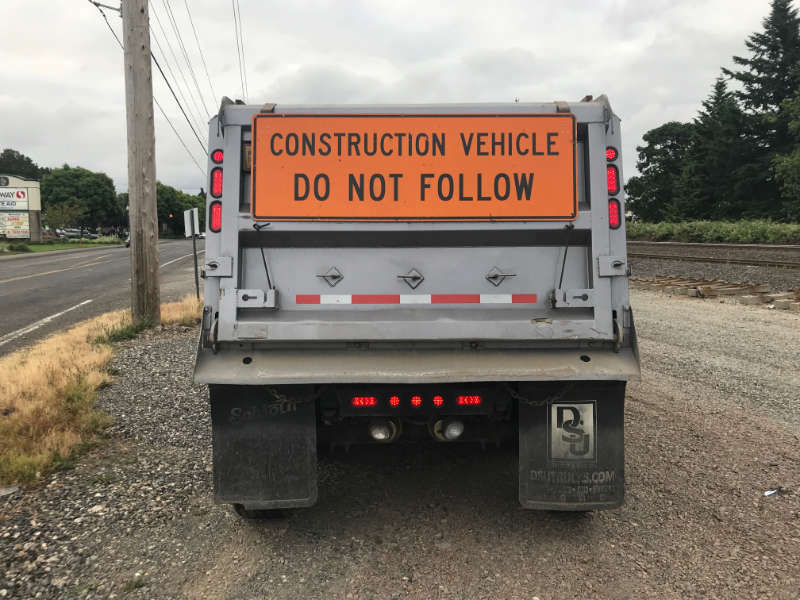 This morning I was driving to the gym and saw a construction truck in front of me with the sign, “Construction Vehicle. Do Not Follow.” Now, if a German friend who didn’t speak English were riding with me and wanted to know what the sign was, how should I translate it? The problem, of course, is that the sign does not say what it means. How can you not follow the truck in front of you? Once the truck is on the road, does the road have to be vacated until it leaves the road? Of course we understand that it means, “Do not follow closely.” So what would be an accurate translation? If you said, “Folge nicht,” would that be an accurate translation for your friend? Or would you have to say, “Folge nicht genau”? It’s kind of like a stop sign. The last thing it means is stop. It means, stop, and when it is your turn go; otherwise, you would never leave the intersection. The second thing that happened was that I was translating Philippians 2 with Martin (a friend) and we came to 2:13. “For it is God who is at work in you, both to will and to work on behalf of his good pleasure (ὑπὲρ τῆς εὐδοκίας).” What is an “accurate” translation of the verse? Every major translation says “his good pleasure,” even though the possessive pronoun αὐτοῦ does not occur. The KJV and NASB put “his” in italics, which is not technically accurate because we know that ὁ (τῆς) can function as a possessive pronoun, and the fact that it is unusual to have ὁ in a prepositional phrase clearly shows that ὁ is functioning as a possessive. So what is more “accurate”? #1 isn’t accurate since it doesn’t mean anything in context. What does “the” refer to? #2 isn’t accurate since “his” is present in the Greek as τῆς. Does John 3:16 Say “Whoever”?